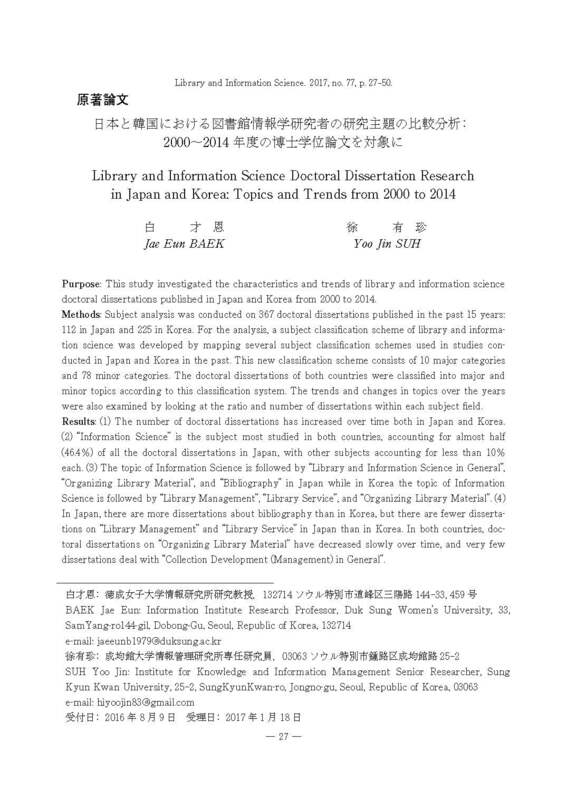 Purpose : This study investigated the characteristics and trends of library and information science doctoral dissertations published in Japan and Korea from 2000 to 2014. Methods : Subject analysis was conducted on 367 doctoral dissertations published in the past 15 years : 112 in Japan and 225 in Korea. For the analysis, a subject classification scheme of library and information science was developed by mapping several subject classification schemes used in studies conducted in Japan and Korea in the past. This new classification scheme consists of 10 major categories and 78 minor categories. The doctoral dissertations of both countries were classified into major and minor topics according to this classification system. The trends and changes in topics over the years were also examined by looking at the ratio and number of dissertations within each subject field. Results : (1) The number of doctoral dissertations has increased over time both in Japan and Korea. (2) "Information Science" is the subject most studied in both countries, accounting for almost half (46.4%) of all the doctoral dissertations in Japan, with other subjects accounting for less than 10% each. (3) The topic of Information Science is followed by "Library and Information Science in General", "Organizing Library Material", and "Bibliography" in Japan while in Korea the topic of Information Science is followed by "Library Management", "Library Service", and "Organizing Library Material". (4) In Japan, there are more dissertations about bibliography than in Korea, but there are fewer dissertations on "Library Management" and "Library Service" in Japan than in Korea. In both countries, doctoral dissertations on "Organizing Library Material" have decreased slowly over time, and very few dissertations deal with "Collection Development (Management) in General"